The Ecosmart 60W Equivalent Bright White (3000K) B10 Dimmable LED Light Bulb (4-Pack) has a classic glass filament. This LED bulb provides bright white light similar to a 60W incandescent bulb while generating less heat. It uses 4.5W and should be used only on 120V, 60Hz circuits. Light appearance: Brightness 500 lumens, Efficiency 111.11 Lumens/Watts, Energy used 4.5 Watts, Life 15,000 Hours, Colour rendering index (CRI) 80 CRI. The Ecosmart 60W Equivalent Daylight (5000K) B10 Dimmable LED Light Bulb with Antique Glass Filament (4-Pack) has a classic glass filament. This LED bulb provides soft white light similar to a 60W incandescent bulb while generating less heat. It uses 4.5W and should be used only on 120 V, 60Hz circuits. Light appearance: Brightness 500 lumens, Efficiency 111.11 Lumens/Watts, Energy used 4.5 Watts, Life 15,000 Hours, Colour rendering index (CRI) 80 CRI. The Ecosmart 60W Equivalent Soft White (2700K) A19 Dimmable LED Light Bulb (3-Pack) has a classic glass filament. This LED bulb provides soft white light similar to a 60W incandescent bulb while generating less heat. It uses 6.5W and should be used only on 120V, 60Hz circuits. Light appearance: Brightness 810 lumens, Efficiency 124.61 Lumens/Watts, Energy used 6.5 Watts, Life 15,000 Hours, Colour rendering index (CRI) 80 CRI. 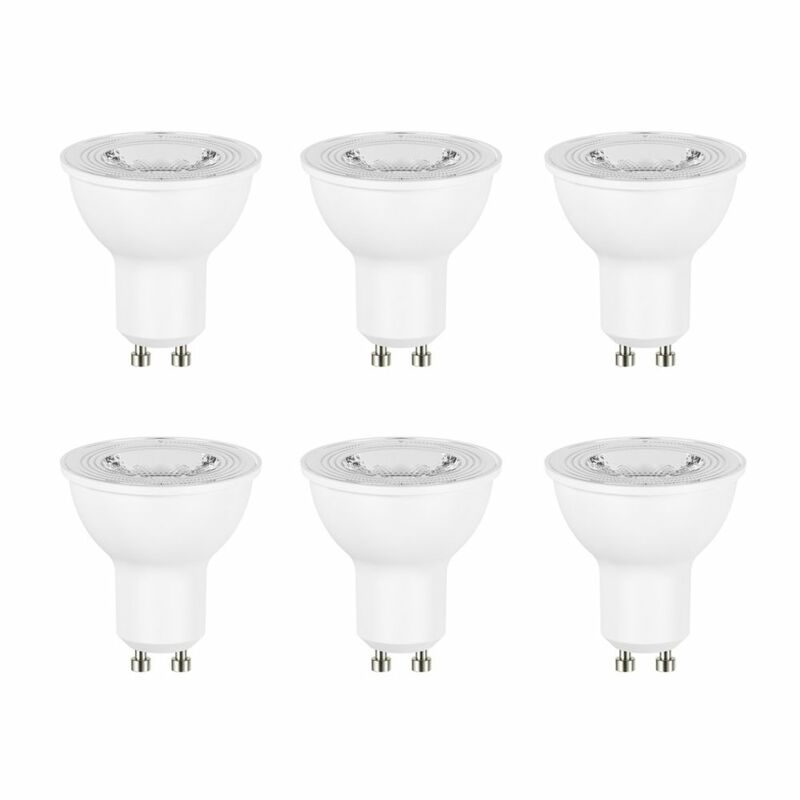 50W Equivalent Bright White (3000K) GU10 Dimmable LED Flood Light Bulb (6-Pack) - ENERGY STAR® The EcoSmart GU10 6-Watt LED Light Bulb can be used to replace an traditional 50W halogen GU10 light bulb. This LED light bulb has an output of 400 Lumens and can last up to 25,000 hours, saving you up to $121 per bulb over the bulb's life. And it is ideal for use in track or recessed lighting fixtures.